On the Marine, the adventure doesn't stop when the tarmac does. Those massive 4-inch tyres ride over every road or off-road imperfection with aplomb. Exposed roots, rocks or even loose sand — the Marine shreds it all, without breaking a sweat. More often than not I found myself in places I never thought a bike would go. In addition to all I could eat on my #100BeachRide diet, I still lost 4.2 kilos in 3 weeks; this despite my huge daily food intake - bananas, malai-barfi, chocolates, vada-pao and at least four meals a day. Those fat tyres shed muck, sand and more importantly rider weight. With a fatbike, you are on an average burning twice the calories (1300 vs 650 / hour) that you would on a road bike. Very important if you're looking to lose some extra kilos while cycling. 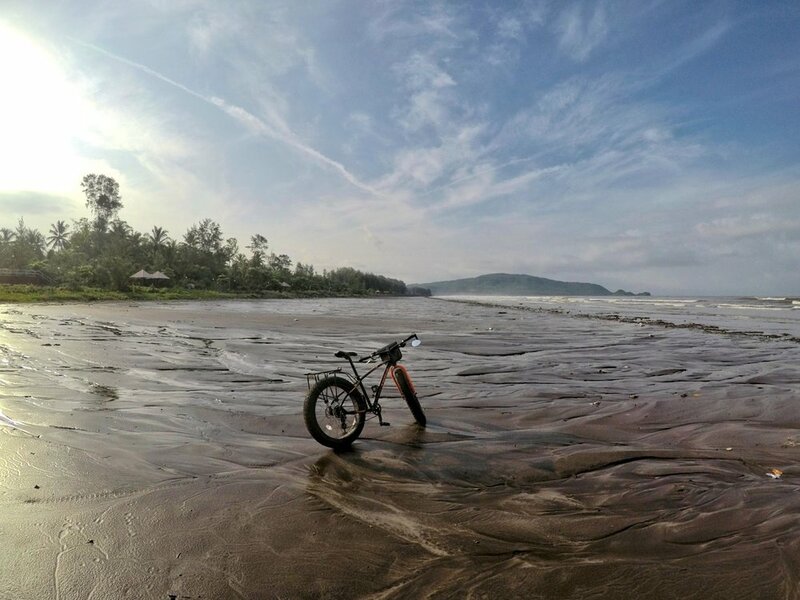 The #100BeachRide was an unsupported solo 1000+ kilometre bicycle tour along the Konkan and Goan coastline. A total of 25 days, starting on August 27 in Mumbai (Maharashtra) and ending on September 20 in Panjim (Goa), this year. I rode through the heart of monsoon season, through record rainfall and flooding, along the Konkan coast. Disdaining all tarmac, I chose to ride on country roads and along the way visited and rode over 100 beaches. Sand, seawater, surf, gravel, rocks, non-existent roads and beautiful tarmac through the deluge and sunny days with 100% humidity, this tour had the makings of an epic adventure. Follow #100BeachRide on my Instagram account. Riding from Mumbai to Alibaug on an excellent National Highway (NH), it is evident that the Marine is ill-suited for tarmac. The fat knobby tyres lose a lot of efficiency over tarmac and I could hear it in the knobs drumrolling over the highway. Yet, the moment I turned off the National Highway after Alibaug and hit the state highway and rural roads, the same tyres came into their own element. For those who have not ventured off the beaten track in India, Indian rural roads are an interconnected network of potholes, gravel and mud interspersed with bits of tarmac. These were the conditions I rode for over 900 kilometres. The fat tyres on the Marine glided over all undulations. I often get numb hands on long bicycle rides, yet not once in three weeks riding the Marine did I get a single day of numb hands. This on a rigid bike with no suspension front or rear. Those fat wheels with their immense sidewalls act as a pneumatic suspension and they work much better than the cheap coil suspension found on most MTB and hybrids available in India. This is how most of the roads are if you step off the National and State Highways in India. 100s of kilometres on such roads and the fatbike is unfazed. It's important to note that tyre pressure plays a very important role on a fatbike. Get it too high and the ride is choppy and you might wonder what I was talking about. When I started from Mumbai I had the tyres pumped to over 25 psi and soon realized that anything over 20 psi turns it into a pogo stick. After a couple of days of experimentation, I found my sweet spot to be 16-18 psi on good tarmac and 14-16 psi on rural roads. Top Tip - If you are planning to get a fatbike, invest in a good low-pressure tyre gauge. Our recommendation - Michelin available on Amazon India. The Marine shows commendable poise off-road. It climbs like a mountain goat over rocks, roots and hard-packed dirt. Running a lower tyre pressure means the tyre squirms and holds onto any surface it can grip. The short stem gives it a lively ride on downhill sections. A lot of times I was wishing for a lower gearing to find the limits of Marine's climbing ability. On tough rock climbs it was me the rider whose knees gave in before the fat tyres gave up grip. On beaches, I lowered the tyre pressure to 8 psi and the Marine crawled over anything the Konkan beaches could throw at it. Deep sand, rocks and even seawater were dealt with without breaking a sweat. More than once I had motorcyclists and cars trying to mimic me, only to be stuck in a sand drift. It was strangely satisfying asking a motorcyclist if he needed a push to get out of a sand drift. The Marine's geometry is more relaxed than trail and mountain bikes. It features a slacker head tube angle and longer chainstays than most MTBs. The Marine is not a corner-carving machine. On the flip side, the longer chainstays translate to a longer wheelbase. This longer wheelbase offers additional stability on straights especially when riding loaded with a rack and panniers. It didn't feel jittery or skittish over extremely poor roads. I never experienced any heel strike to my panniers through the #100BeachRide and the bike remained poised and controlled over sharp ghat descents where I was regularly hitting speeds between 40-50kmph with a fully loaded bike. While everyone assumes that the Konkan coastline is a flat piece of sun and surf paradise - this is far from the truth. The Konkan coastline lies along the Western flanks of the Deccan Plateau (referred colloquially as the "Ghats") and the only straight roads are the tops of these plateaus, and the ascends and descends are steep. It's no wonder that the Konkan Railway with a total number of over 2,000 bridges and 91 tunnels was the biggest and perhaps the most difficult railway engineering project on the Indian subcontinent at the time. If you can stop admiring the scenery :) the Marine's frame is a relaxed MTB design. Note the longer head tube which means that the handlebars are almost at seat height (no aero tuck). Also note the short handlebar stem and longer than usual chainstays which give it a longer wheelbase. The short 60 mm stem coupled with my upgraded 720 mm handlebars made the Marine snappy with direction changes and kept me in the right open chested riding position for those knee-racking ghat climbs. I feel that an even shorter stem (40mm) may be perfect for the Marine if you're planning to ride it over narrow singletracks. If there was one aspect that bothered me about the frame, it was the front fork. On the Marine, the front fork was not centred perfectly over the tyre (yes I measured it with a calliper). This causes juddering when feathering the brakes. This judder was a little unsettling over long descents where I was constantly feathering the front brakes to keep my speed in check. By default the Marine ships with a 1x (pronounced one by) drivetrain. This setup features a 34 tooth Sulane crank and a 14-28 (7 speed) Altus freewheel in the rear. A Shimano Altus derailleur linked to an Altus trigger shifter handles the shifting duties. I was impressed with the Altus' shifting ability. I ride a Tourney equipped budget MTB around town and I can swear that the Altus shifts are crisper and much more refined than Tourney. While most branded bikes that cost more than the Marine are content shipping with a Tourney drivetrain, I am happy FitTrip Bikes has equipped their model with a step up. One groupset upshift may seem inconsequential but in real life riding this makes a huge difference in shift quality and riding pleasure. Despite the Altus drivetrain, the gearing ratios on the Marine are inadequate for high mountains. Don't get me wrong - this gearing is more than sufficient for normal city riding and rolling hills. Yet this bike is capable of much - much more. If you want to push the limits of what the Marine can do you, will be begging for a lower (or wider) gearing. This is the reason that I swapped the front crank for a 32 tooth crank and the rear freewheel with a 14-34 tooth Shimano MegaRange freewheel for the #100BeachRide. This change gave me lower crawling ability at the cost of top speed. In hindsight, I wish I could have gone even lower. A freewheel based rear hub means that the Marine is limited to 8 gears in the rear (no-one makes 9 speed or higher freewheels). I really wish FitTripBikes introduces a cassette rear hub in the next version of the Marine. This will give us riders much more options to experiment with gear ratios. A cassette hub means we could swap to Shimano's 11 speed 11-42 or maybe even SRAM's 12 speed 10-50 tooth cassette! I swapped the default Shimano Altus 7 speed freewheel with Shimano's "MegaRange" 14-34, 7 speed freewheel. It gave me a much lower (34 tooth) gear for those steep inclines. Over the #100BeachRide (1000+ kilometres) the only breakdown I had was one puncture. Given the entry-level components on the bike, I was expecting a lot more. It is for this reason I was carrying over 4 kg of spares and bike repair kit in my panniers and now I feel like an idiot lugging them for over a 1000 kilometres. By the time I was in Goa I had thrown all caution to the wind and was punishing the Marine over declines, through bad roads and pulling off my fair share of wheelies. Yet, despite my antics, the bike refused to break down. The Marine may not come with exotic components but the ones on offer are rugged and offer excellent value for money. This is an important consideration given the state of roads in small towns and even in metros like Mumbai. Do not buy a fatbike if you’re not ok being the centre of attention. Unless you own a yellow Lamborghini, this is by far the most attention you will get on any road in India. People will want to touch the tyres, ask questions or just look at you in shock and awe. I’ve had cars swerve in front of me, motorcyclists who’ve followed me for miles, people have offered me food and even drink for a short ride. Everyone I met on the #100BeachRide had questions, comments and compliments for me. Let's just say the Marine is not a subtle ride. Irrespective of whether you ride it in rural India or the biggest metro city, people will want to touch and feel your ride. Don't buy the Marine if you can't handle the attention! Starting with the first mainstream fatbike (Surly Pugsley) - there is an ever-increasing trend of using fatbikes for bikepacking across developing countries, deserts and remote mountains. The use of oversized tyres will only increase over time. If you're looking to bikepack off the beaten trail in India, a rigid fatbike like the Marine makes a valid case for itself. The state of roads in rural India is the perfect terrain for a fatbike. With a rigid bike, there is less to go wrong and those fat wheels glide over most terrain you're likely to encounter. However, in 2017, we are still seeing the first generation of fatbikes in India. It is still a niche market segment, although growing rapidly. A niche segment means that spare availability is an issue with the Marine and fat bikes in general. 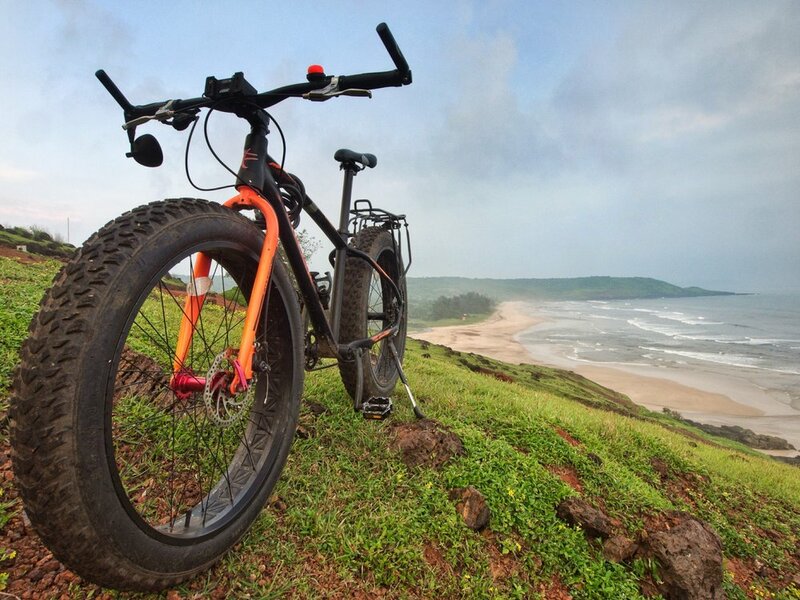 Fat bike specific components like bottom brackets, wheels, hubs and tyres are not yet available at local bicycle shops and online retailers in India. This means you are dependent on your bicycle manufacturer for spares and support. FitTripBikes assures me they will continue to support their models for two years. Yet, the lack of spares and customisability is often limiting. To give you an example I had to get a custom rack made for the Marine as the ones available off the shelf were not wide enough to accommodate 4" tyres. On the flipside, a fatbike is not a delicate road bike. Every component of this bike (including the fat tyres) will outlast a couple of years of riding for a regular Joe. A fatbike is heavy, there is no getting around that fact. However, it works in your favour if you're looking to train or to lose weight on a bicycle. The added rolling resistance of those fat wheels means that the rider is burning more calories for the same ride distance. This was evident in the #100BeachRide where I lost over 4 kilos in 3 weeks despite extremely calorie dense meals. Unless you plan to ride in flats or are an extremely light rider you will want to change the gearing on the Marine. In its default avatar, the Marine does not offer the gear spread for lugging a loaded fatbike across mountains. A Shimano Megarange freewheel (cost under ₹ 1500) that provides a wider ratio can help. The only water bottle mount on the down tube is inexcusable. Any adventure bike needs at least two bottle braze-on (preferably three in my opinion). However, despite the single water bottle mount and the weight, I am still using the Marine for my daily ride. The reason for this choice is simple - it is the only bicycle I can run through the year. I live in the Himalaya and get over a metre of snow every winter and the 4" wheels allow me to ride throughout the year. It allows me to explore mountain trails, boldly go where no bike has gone before and yet in relative comfort. For modern-day backcountry use, a reliable, rigid fork seems like a wise choice. With no oil or air to leak out, very little could go wrong. Touch wood. Build & Components. Over a gruelling 1000+ kms that included a lot of spray, salt, record rain and sand (the worst enemies of a bicycle) nothing broke or came loose. 1x drivetrain. Simple to use for newbies. No chain crossover to worry about and the chain didn't skip once over a 1000kms on some very bad roads. Front fork. The front fork needs work. It's not centred around the tyre which causes micro judders when braking hard. Inadequate rim tape. The rim tape is inadequate and does a poor job of protecting the tubes especially if you are curb jumping or looking to bunnyhop etc. The first thing that needs to be replaced using Schwalbe rim tape. Rims. The 100mm rims are heavy and there is a pronounced weld running through them. Single frame size. While it fits me perfectly and will fit most Indians from 5'5" to 5'10" (I'm 5'7"), a frame available in 3 sizes (S, M, L) will make it for accessible for taller and shorter riders. The closest analogy to the FitTrip Bikes Marine is an SUV. 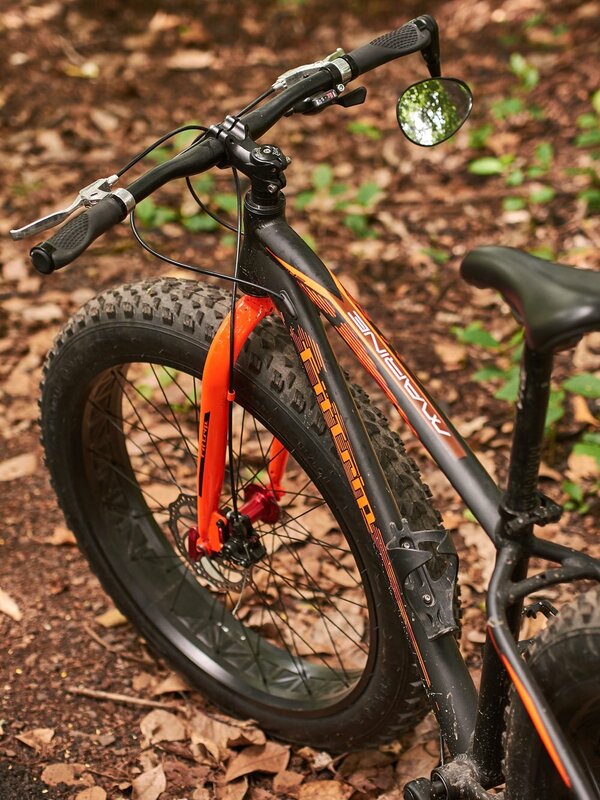 Just like an SUV, a fatbike is meant to go bad-roading. It makes mincemeat of bad roads, yet is not the best choice if you ride it primarily on tarmac. The Marine is a capable trail bike as long as you're not in a rush or want to keep up with your friends. It weighs more than a mountain bike and this means it takes a lot more effort to accelerate. However, once you get it to speed, it is a tank and will plough through or roll over any obstacle and tenaciously hang on long after mountain bikes have given way. Off the beaten path, it will chew up Indian (lack of) roads. More than everything else, it offers a fun-filled ride and is the ticket for anyone looking to lose weight on a bicycle. I've been solo bikepacking for over 7 years and have ridden 7,000 kilometres across Europe. My favourite routes include Ronde Netherlands, Eurovelo 1, 4 and 6 and Via Claudia Augusta. These days I prefer long rugged bikepacking trips off the beaten path in India. The Marine was provided to me by FitTripBikes for the purpose of this review. The review and my opinions are independent and based on my using the bike over 3 weeks on the #100BeachRide. I receive no incentive from this review. 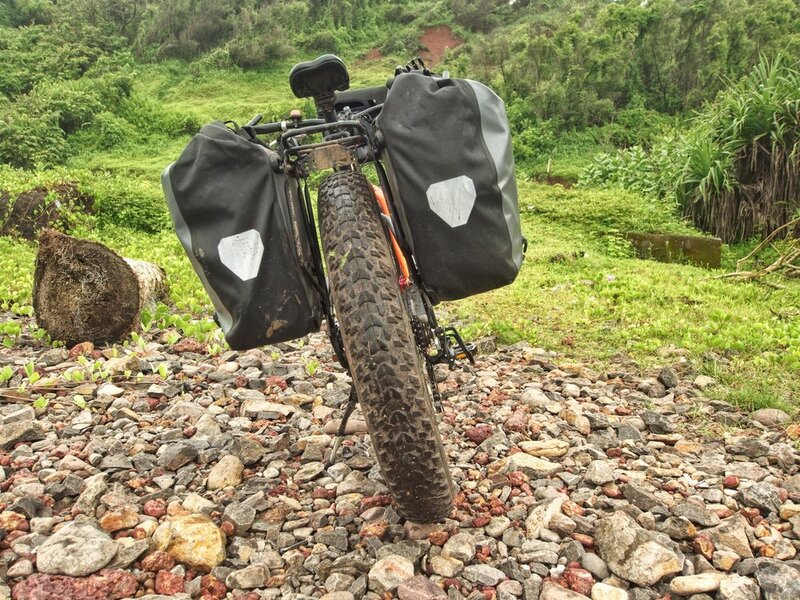 We think that the Marine with ultra-low gearing needs a longer sojourn in the Himalaya. We are urging FitTrip Bikes to build a no-budget barred badass fattie for some serious snow shredding in 2017-18. Hopefully, they will oblige.